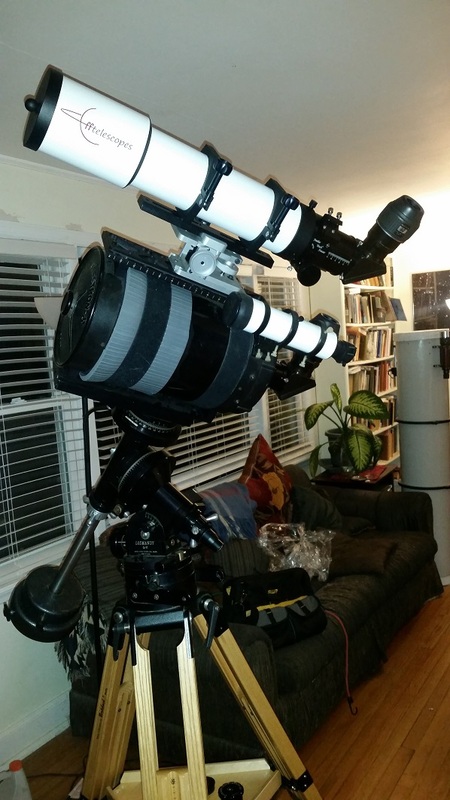 Although the rest of my other 2 scopes remain up north at my full time residence (near Chicago), I have just this month moved my C-8/E on it's Ioptron AZ Pro mount, an original set of Q70 Orion and my TV 8mm Etho's ep's down to the south of Tucson area where my parent's reside and I often visit now (not enough space to store my 15" dob here ). When the skies and wind finally cooperated a couple of nights ago I was greeted to the stunning beauty of our galaxy. I bought a used Celestron binoviewer, and a new pair of Meade HD60/25mm ep's for it (the BV came with a set of unmatched15mm) and am trying to learn how to use it. 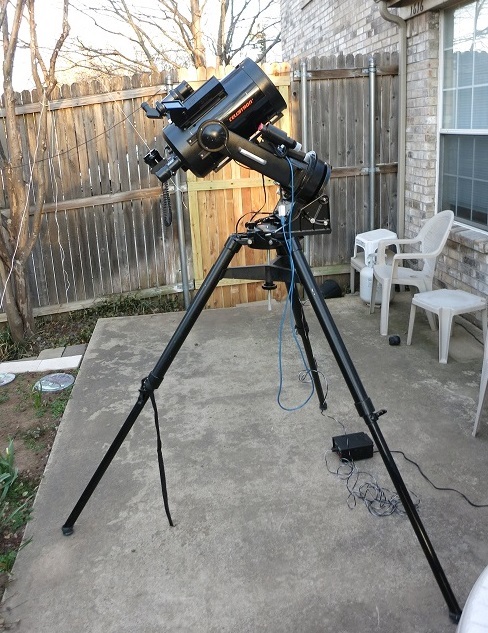 I have also just ordered a Baader sct adaptor, star diag and 2"-1.25" adaptor (I never liked the Celestron threaded diag, a real pain to change position). I suspect I will be keeping a couple of my TV ep's in my luggage when I fly this way. Now I'm glad I didn't sell the setup. I never knew how good this ota could be. I was able to observe targets (planetary nebula, etc) not visible up north. M42 and 45 were just stunning (glad now I had bought the Edge focal reducer) along with other clusters. Now I need to get up early morning to see Jupiter and Saturn. Anyway it's nice to fall in love again. It’s easy to crush on the C8E, it’s a fantastic scope. Congrats on rekindling the romance. Now go out and buy her that 17 ethos she longs for! What is a C8E? I am not familiar with that. Thanks. It’s the C8 edge but I was too lazy to type it out. Oh, OK. I have one of those too. Very nice scope! last summer I bought an old C8 (smooth back, XLT starbright coatings, sometime around the '90's vintage) that was kinda beat cosmetically but the price was right so I picked it up, never having owned a 8" cat before. it continually amazes me with what it can do. saturday night we had pretty clear skies so I had it out early cooling down then once it got dark went to work and was duly rewarded. for the first time ever, I was able to see the dust lane in M82 - Wonderous! with a 22T4, M42 went edge to edge of the EP and the detail in the nebula was amazing. with the 12mm T4, E and F were easily found. what a bargain these scopes are! A C8 (XLT or EdgeHD) is a superb scope and much underappreciated. Over the past 20+ years many scopes have come and gone (premium refractors, large dobs etc.) but I have always had a C8. The balance between aperture/capability, size and weight is unmatched - probably single handedly responsible for keeping me in the hobby even during times when life's priorities took me in different directions. These days I use my C8 with my M2C mount w/ encoders on a Manfrotto 028 tripod - Weighing in at just ~25lbs and super compact It is my most used setup by far. Not an edge but I like posting the picture. Old OTA with 2015 optics. I had this beauty since my Father gave it up when it got to heavy for him. Celestar C-8 Deluxe Computerized - 1998 vintage. Properly collimated it give superb views when configured for visual observing. Unfortunately the main mirror is out of collimation for Fastar mode so its restricted to F/10 viewing and photography at the moment. Edited by photonhunter, 26 March 2019 - 10:37 PM.